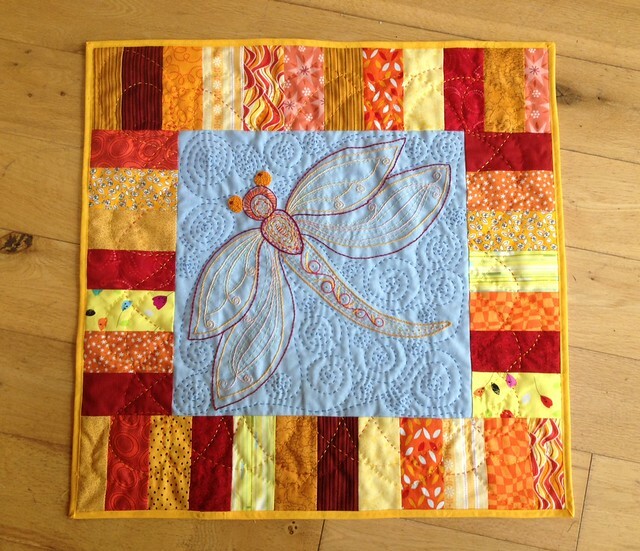 Featuring Irina - A Blogger's Quilt Festival Quilter! I remember my very first quilting work when I was about 14 or 15. At that time I only knew hand sewing and was very fond of cross stitching. There was a shop in Barcelona, where I come from, where I used to buy all my supplies and admire all those patchwork quilts and pillows they had all around. I wanted to have a go so I bought some fat quarters and designed my own pillow. I made my templates out of cardboard, used a pencil to trace them onto the fabric and cut the pieces with scissors. I had no idea how to quilt it so I signed up for a hand quilting lesson in that very same shop. That panel never became a pillow though, I use it now as a place mat in my sewing room. When I look at it, I think it is not bad at all for being my first project. The fabrics then were very traditional, we’re talking about 1992-1993! I didn’t go back to serious patchwork until a few years after I came to Ireland, in 2003. A friend lent me a sewing machine and I had entered the internet world discovering all these blogs. I couldn’t believe how fast and accurate you can be with a ruler, a cutting mat and a rotary cutter. Bliss! 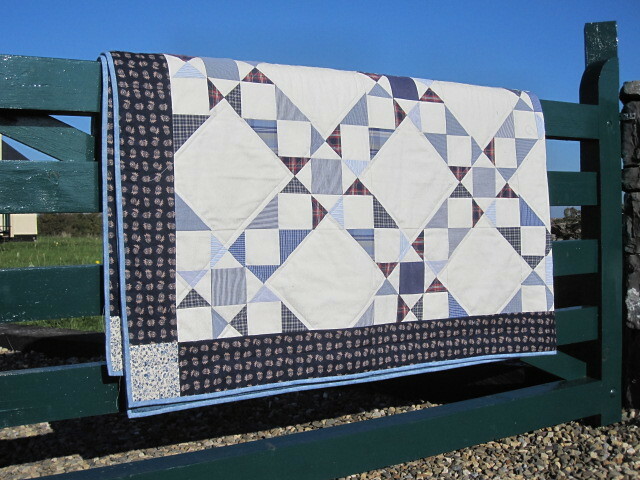 So then you had me embracing the new patchwork era with my first big quilt, (very ambitious if you ask me…) I followed a pattern from a book I got and sourced lots of gent’s shirts, mainly blue/white, from charity shops. This time I needed a quilting lesson on a sewing machine, so slowly I was learning about all the bits and bobs you need for quilting. I had never ever heard about a walking foot before…! After this quilt, I have made several more while learning many tricks from books but mostly from blogs and youtube tutorials and embraced the new modern patchwork style. I have always liked making things, I like the process of making something. If I saw something I liked, I always wanted to know how to make it, and that applies to everything. So I quilt because I like all what is involved in it: choosing the fabrics, the colour, the pattern, and see how it slowly materialises into this beautiful piece of work. Quilting is my favourite part of the process, seeing how the texture changes into the bulky and soft layers… I really love! I like the different shortcuts for cutting and piecing quilters have come up with. I can’t remember which blog I sew this tip that stuck in my mind but I found it really helpful to place 2 squares right side together and sew 1/4″ along the perimeter. Then cut 2 diagonal lines and you have 4 HST. Anything that will teach you how to piece in a much quicker way I welcome. My entry for the Quilt Festival was my first quilt design. I had joined a quilting bee the previous year where we had to use scraps of fabric. We could either use our own block design or someone else’s, so I decided to try and make my own. I got the inspiration from a quilt made of tiny scraps all scattered on a white background. I took that idea of scattering all the colour bits and inspired as well in the images of Supernova stars that you find in Astronomy books (we are star gazers in our home). The quilt is made out of 24 blocks. When you put 4 of them together with the cluster of 1inch squares in the centre you get the Supernova star effect. That’s what I wanted to achieve. I requested to use red scraps as I always wanted to have a red and white quilt. It is not an easy block because it involves a lot of precise cutting and scant seam sewing, but very rewarding when you see the final work. My first garment was this top for my daughter using voile. Thanks for sharing Irina! I’m so glad you are able to enjoy so many creative outlets!